The holiday season kicked off in Kahnawake with lights and action, as the Christmas Craft Fair and annual Holiday Parade light up the community Sunday. The annual Christmas Craft Fair kicked off this weekend at the Knights of Columbus filling residents with excitement, as they prepared to get their shop on. The craft fair had 50 vendors selling arts & crafts, traditional beadwork, woodwork, paintings, baked goods, chocolates, knitting, clothing, candles, and much more. This year marked the 12th year the Kateri Memorial Foundation has hosted the event. “It’s always successful and we have over 50 vendors, we’ve been sold out for two months, and every year we collaborate with an organization,” said KMF director Lois Montour before the fair. This year the Kateri Memorial Foundation collaborated with the Kahnawake Library. “We rent the building, and we both promote the event and our organizations,” said Montour. The Kahnawake Library served cornbread and sausages, which were an instant hit and sold out. The family fun Christmas gift basket, the highlight door prize on the day, generated $1,000 for the KMF, and went to winner Binnie Barnes. The other door prizes, donated by some of the vendors, included handcrafted items and other knick-knacks. “We usually get over 40 items, and throughout the day we draw the items. The fair doesn’t have a set dollar for entry, but attendees were encouraged to donate anything they can,” said Montour. The fair is a perfect place to start looking for early Christmas gifts. “We had a lot of our community members doing craft work and others from Akwesasne and other areas. Meat-pies were being sold, and they always sell,” said Montour. 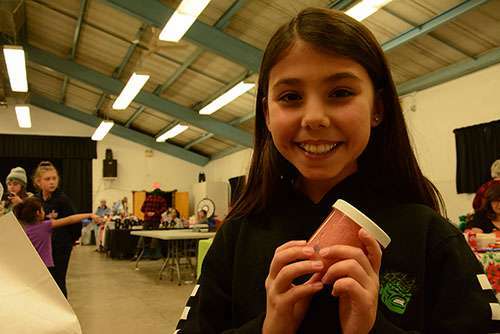 Lola Thomas sold slime at the fair, and proved a quality salesperson selling 200 slime packs. She was mum, however, on her secret to making the slime. “I don’t know if I’m allowed to tell,” said the 10-year-old Thomas. While the fair was up and running, the Kahnawake Peacekeepers prepared for the annual Christmas Parade. The parade began at 5 p.m. and was the perfect way to end a holiday Sunday. This year the PKs took over hosting duties from KSCS (Kahnawake Shakotiia’takehnhas Community Services), who organized it in prior years. “It was a huge success, all the floats and parade got positive feedback by the community, and the highlight of the event was the fireworks provided by JoJo’s Pawnshop,” said organizer Tara Jacobs. “The police station was packed (after the parade) with children and families, over 200 people were attended with food and drinks provided by Playground Poker,” said Jacobs. This year, there was a contest for best floats with the Peacekeepers winning, the Mohawk Council Of Kahnawake runners up, and Step by Step taking third prize. Floats were judged on presentation and theme. The PKs theme was Santa’s little helpers in a big sleigh, Step by Step did a take on Christmas lights and the MCK took a trip down the yellow-bricked road in a Wizard of Oz theme. “It was an instant hit, especially at night,” said Jacobs. The floats lined up on the other side of the tunnel and traveled down the Old Malone highway to Karonhianónhnha School. Kids got a chance to see Santa after at the station, and were given advent calendars as a gift before the holidays. The holiday train continues this weekend, literally. Sunday is the annual Canadian Pacific Holiday Train, which starts at 6:15 p.m. with the Sam Roberts band and Jojo Mason performing free of charge. Volunteers will be giving out hot chocolate and snacks. Donations will go to the Kateri Food Basket, and to reduce traffic in the area, the MCK will provide a free shuttle bus from the town garage at 5 p.m. to bring passengers to the Adirondack junction and return after the event.